Sinningia tuberosa (top, a botanical print by Curtis from 1838) and S. defoliata are similar. 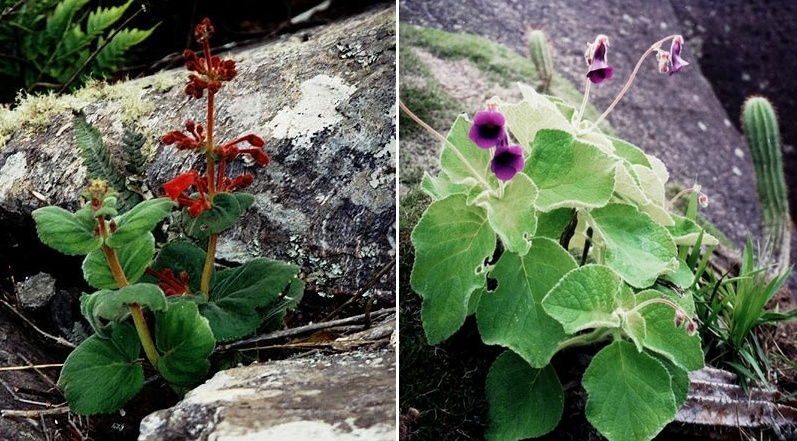 Both have red flowers that bloom directly from the tuber. They are not actually closely related. Most plants of the alliance are small shrubs, often with a dormant period when the annual growth is shed. Some of the species grow taller and have a preference for open meadows where they receive full sun. Many, but not all species have tubers. Shaded plants have tubers close to the surface while plants that grow in full sun bury their tubers in the soil. Two species, S. douglasii and S. cooperi can be epiphytic. About half the plants in the alliance grow on hillsides, cliffs or rocky outcrops. These plants usually have their tubers near the soil surface or partially exposed. Two recognized species, S. defoliata and S. helioana, and one unpublished species, S. sp. “Pancas”, have a highly unusual habit. They appear to be stemless (like unifoliate plants in the genus Streptocarpus) although what appears to be a petiole is actually a peculiar stem. All three of these taxa put up flower stalks directly from the tuber and not from regular stems or extensions of stems. S. magnifica (left) and S. bragae both grow in rocky landscapes, although the latter is often in full sun in very well-drained locations. Note the cactus in proximity.